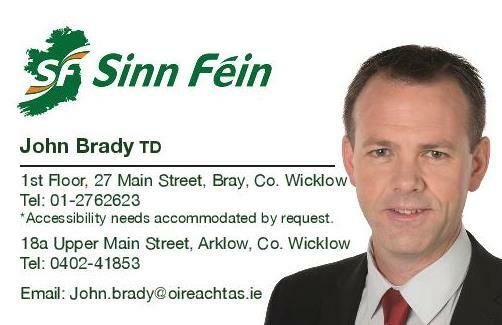 Sinn Féin TD for Wicklow/East Carlow John Brady has given a cautious welcome to the news that the GP Out of Hours Service to cover North Wicklow is to be in place by June. “Over the last year Sinn Féin have lead the campaign to have a HSE funded GP Out of Hours Service for the people of North Wicklow. In 2016 we had announcements that the funding was secured for the service and that it would be in place in early 2017, unfortunately that funding was pulled without explanation. So, I cautiously welcome the latest announcement, and will keep the pressure on until the service is operational. “North Wicklow remains as one of the largest urban areas in the State to be without such a service and continues to cause huge problems for people needing to access a GP outside surgery hours. We have already had a number of public meetings and handed in a petition to Minister Harris containing hundreds of signatures. “In recent weeks, we have heard of horrific cases of people being left without emergency care outside of normal GP hours and the consequences of such. This is the very reason that this service is so badly and urgently needed. The operation of the service is expected to go out for tender in February and it’s expected that it will be fully operational by June. 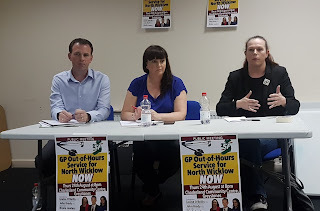 “Sinn Féin has been to the forefront in ensuring that the GP Out of hours service is now finally being delivered. Over the last year we have ran a very successful campaign, we have held public meetings in Bray and Greystones and last October, I, along with my fellow Sinn Féin Councillors and John handed in a petition containing hundreds of signatures to Minister Harris’ in Leinster House. “This is fantastic news for the people of North Wicklow. When operational the service is intended to cover the night time hours from Monday to Friday and 24 hour cover at weekends and Public Holidays, providing urgent General Practitioner services to patients outside of normal surgery hours. It is expected that approximately 9,000 patients per month will benefit from this GP Out of Hours Service. This will replace the unsatisfactory private arrangements that are currently in place. This service will bring an end to patients having to wait 36hours or more to see a GP, or having to go to A&E because of the inability to access a GP which is a critical part of Primary Care.